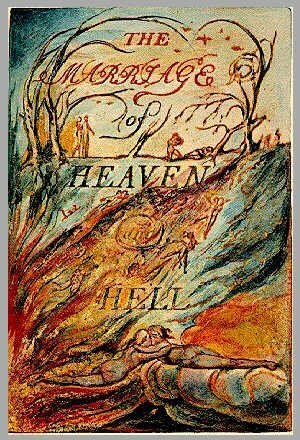 As a new heaven is begun, and it is now thirty-three years since its advent: the Eternal Hell revives. And lo! Swedenborg is the Angel sitting at the tomb: his writings are the linen clothes folded up. Now is the dominion of Edom, & the return of Adam into Paradise. See Isaiah XXXIV and XXXV. All Bibles or sacred codes. have been the causes of the following Errors. 2. That Energy. calld Evil. is alone from the Body. & that Reason. called Good. is alone from the Soul. 1. Man has no Body distinct from his Soul for that calld Body is a portion of Soul discernd by the five Senses, the chief inlets of Soul in this age. And the original Archangel, or possessor of the command of the Heavenly Host, is calld the Devil or Satan, and his children are call’d Sin & Death. But in the Book of Job, Milton’s Messiah is called Satan. When I came home; on the abyss of the five senses. where a flat sided steep frowns over the resent world. I saw a mighty Devil folded in black clouds, hovering on the sides of the rock, with [ page ]corroding fires he wrote the following sentence now perceived by the minds of men, & read by them on earth. The hours of folly are measur’d by the clock, but of wisdom: no clock can measure. All wholsom food is caught without a net or a trap. Bring out number weight & measure in a year of dearth. No bird soars too high. if he soars with his own wings. A dead body, revenges not injuries. The selfish smiling fool. & the sullen frowning fool, shall be both though wise. that they may be a rod. What is now proved was once, only imagin’d. The rat, the mouse, the fox, the rabbet; watch the roots, the lion, the tyger, the horse, the elephant, watch the fruits. The eagle never lost so much time. as when he submitted to learn of the crow. He who has suffered you to impose on him knows you. Listen to the fools reproach! it is a kingly title! The eyes of fire, the nostrils of air, the mouth of water, the beard of earth. The apple tree never asks the beech how he shall grow, nor the lion, the horse; how he shall take his prey. The thankful reciever bears a plentiful harvest. As the catterpiller chooses the fairest leaves to layer her eggs on, so the priest lays his curse on the fairest joys. The best wine is the oldest. the best water the newest. Prayers plow not! Praises reap not! Joys laugh not! Sorrows weep not! The crow wish’d every thing was black, the owl, that every thing was white. If the lion was advised by the fox. he would be cunning. Truth can never be told so as to be understood, and not be believ’d. The ancient Poets animated all sensible objects with Gods or Geniuses, calling them by the names and adorning them with the properties of woods, rivers, mountains, lakes, cities, nations, and whatever their enlarged & numerous senses could perceive. And particularly they studied the genius of each city & country, placing it under its mental deity. Till a system was formed, which some took advantage of & enslav’d the vulgar by attempting to realize or abstract the mental deities from their objects; thus began Priesthood. Then I asked: does a firm perswasion that a thing is, make it so? He replied, Al poets belive that it does, & in ages of imagination this firm perswasion removed mountains; but many are not capable of a firm perswasion of any thing. Then Ezekiel said. The philosophy of the east taught the first principles of human perception some nations held one principle for the origin & some another, we of Israel taught that the Poetic Genius (as you now call it) was the first principle and the others merel derivative, which was the cause of our despising the Priests & Philosophers of other countries, and prophecying that all Gods [ page ]would at last be proved to originate in ours & to be the tributaries of the Poetic Genius, it was this. that our great poet King David desired so fervently & invokes so patheticly, saying by this he conquers enemies & governs kingdoms; and so we loved our God. that we cursed in his name all the deities of surrounding nations, and asserted that they had rebelled; from these opinions the vulgar came to think that all nations would at last be subject to the jews. I heard this with some wonder, & must confess my own conviction. After dinner I ask’d Isaiah to favour the world with his lost works, he said none of equal valu was lost. Ezekiel said the same of his. I also asked Isaiah what made him go naked and barefoot three years? he answerd, the same that made our friend Diogenes the Grecian. I then asked Ezekiel. why he eat dung, & lay so long on his right & left side? he answerd, the desire of raising other men into a perception of the infinite[;] this is the North American tribes practise. & is he honest who resists his genius or conscience. only for the sake of present ease or gratification? For the cherub with his flaming sword is hereby commanded to leave his guard at tree of life, and when he does,the whole creation will be consumed, and appear infinite. and holy whereas now it appears finite & corrupt. For man has closed himself up, til he sees all things thro’ narrow chinks of his cavern. In the second chamber was a Viper folding round the rock & the cave, and others adorning it with gold silver and precious stones. In the third chamber was an Eagle with wings and feathers of air, he caused the inside of the cave to be infinite, around were numbers of Eagle like men, who built palaces in the immense cliffs. In the fourth chamber were Lions of flaming fire raging around & melting the metals into living fluids. The Giants who formed this world into its sensual existence and now seem to live in it in chains, are in truth, the causes of its life & the sources of all activity, but the chains are, the cunning of weak and tame minds, which have power to resist energy. according to the proverb, the weak in courage is strong in cunning. Thus one portion of being, is the Prolific, the other, the Devouring: to the devourer it seems as if the producer was in his chains, but it is not so, he only takes portions of existence and fancies that the whole. But the Prolific would cease to be the Prolific unless the Devourer as a sea recieved the excess of his delights. Some will say, Is not God alone the Prolific? I answer, God only Acts & Is. in existing beings or Men. These two classes of men are always upon earth. & they should be enemies; whoever tries to reconcile them seeks to destroy existence. Note. Jesus Christ did not wish to unite but to seperate the two, as in the Parable of sheep and goats! & he says I came not to send Peace but a Sword. Messiah or Satan or Tempter was formerly thought to be one of the Antediluvians who are our Energies. An Angel came to me and said O pitiable foolish young man! O horrible! O dreadful state! consider the hot burning dungeon thou art preparing for thyself to all eternity, to which thou art going in such a career. So he took me thro’ a stable & thro’ a church & down into the church vault at the end of which was a mill; thro’ the mill we went, and came to a cave. down the winding cavern we groped our tedious way till a void boundless as a nether sky appeared us, & we held by the roots of trees and hung over this immensity, but I said, if you please we will commit ourselves to this void, and see whether this providence is here also, if you will not I will? but he answerd, do not presume O youngman but as we here remain behold thy lot which will soon appear when the darkness passes away. But now, from between the black & white spiders a cloud and fire burst and rolled thro the deep blackning all beneath, so that the nether deep grew black as a sea & rolled with a terrible noise: beneath us was nothing now to be seen but a black tempest, till looking east between the clouds & the waves. we saw a cataract of blood mixed with fire and not many stones throw from us appeard and sunk again the scaly fold of a monstrous serpent. at last to the east, distant about three degrees appeard a fiery crest above the waves slowly it reared like a ridge of golden rocks till we discoverd two globes of crimson fire. from which the sea fled away in clouds of smoke, and now we saw, it was the head of Leviathan, his forehead was divided into streaks of green & purple like those on a tygers forehead: soon we saw his mouth & red gills hang just above the raging foam tinging the black deep with beams of blood, advancing toward us with all the fury of a spiritual existence. My friend the Angel climb’d up from his station into the mill; I remain’d alone, & then this appearance was no more, but I found myself sitting on a pleasant bank beside a river by moon light hearing a harper who sung to the harp. & his theme was, The man who never alters his opinion is like standing water, & breeds reptiles of the mind. But I arose, and sought for the mill & there I found my Angel, who surprised asked me, how I escaped? I answerd. All that we saw was owing to your metaphysics; for when you ran away, I found myself on a bank by moonlight hearing a harper, But now we have seen my eternal lot, shall I shew you yours? he laughd at my proposal; but I by force suddenly caught him in my arms & flew westerly thro’ the night, till we were elevated above the earths shadow: then I flung myself with him directly into the body of the sun, here I clothed myself in white, & taking in my hand Swedenborgs volumes sunk from the glorious clime and passed all the planets till we came to saturn, here I staid to rest & then leap’d into the void, between saturn & the fixed stars. Here said I! is your lot, in this space if space it may be calld, Soon we saw the stable and the church, & I took him to the altar and open’d the Bible, and lo! it was a deep pit, into which I descended driving the Angel before me, soon we saw seven houses of brick, one we enterd; in it were a number of monkeys. baboons, & all of that species chaind by the middle, grinning and snatching at one another, but witheld by the shortness of their chains: however I saw that they sometimes grew numerous, and then the weak were caught by the strong and with a grinning aspect, first coupled with & then devoured, by plucking off first one limb and then another till the body was left a helpless trunk. this after grinning & kissing it with seeming fondness they devourd too; and here & there I saw one savourily picking the flesh off his own tail; as the stench terribly annoyd us both we went into the mill, & I in my hand brought the skeleton of a body, which in the mill was Aristotles Analytics. So the Angel said: thy phantasy has imposed on me & thou oughtest to be ashamed. A man carried a monkey about for a shew, & because he was a little wiser than the monkey, grew vain, and conceiv’d himself as much wiser than seven men. It is so with Swedenborg: he shows the folly of churches and exposes hypocrites, till he imagines that all are religious. & himself the single one on earth that ever broke a net. Now hear a plain fact: Swedenborg has not written one new truth: Now hear another: he has written all the old falshoods. And now hear the reason. He conversed with Angels who are all religious, & conversd not with Devils who all hate religion, for he was incapable thro’ his conceited notions. Thus Swedenborgs writings are a recapitulation of all superficial opinions, and an analysis of the more sublime, but no further. Have now another plain fact: Any man of mechanical talents may from the writings of Paracelsus or Jacob Behmen, produce ten thousand volumes of equal value with Swedenborg’s. and from those of Dante or Shakespeare, an infinite number. Once I saw a Devil in a flame of fire, who arose before an Angel that at on a cloud. and the Devil utterd these words. The worship of God is. Honouring his gifts in other men each according to his genius. and loving the [ page ]greatest men best, those who envy or calumniate great men hate God, for there is no other God. The Devil answer’d; bray a fool in a morter with wheat. yet shall his folly not be beaten out of him: if Jesus Christ is the greatest man, you ought to love him in the greatest degree; now hear how he has given sanction to the law of ten commandments: did he not mock at the sabbath, and so mock the sabbaths God? murder those who were murderd because of him? turn away the law from the woman taken in adultery? steal the labor of others to support him? bear false witness when he omitted making a defence before Pilate? covet when he pray’d for his disciples, and when he bid hem shake the dust off their feet against such as refused to lodge them? I tell you, no virtue can exist without breaking these ten commandments; Jesus was all virtue, and acted from im -pulse, not from rules. Note. This Angel, who is now become a Devil. is my particular friend: we often read the Bible together in its infernal or diabolical sense which the world shall have if they behave well. I have also; The Bible of Hell: which the world shall have whether they will or no. 2. Albions coast is sick silent; the American meadows faint! 8. On those infinite mountains of light now barr’d out by the atlantic sea, the new born fire stood before the starry king! 9. Flag’d with grey brow’d snows and thunderous visages the jealous wings wav’d over the deep. 10. The speary hand burned aloft, unbuckled was the shield, forth went the hand of jealousy among the flaming hair. and hurl’d the new born wonder thro’ the starry night. 11. The fire, the fire, is falling! 13. The fiery limbs, the flaming hair, shot like the sinking sun into the western sea. 16. Falling, rushing, ruining! buried in the ruins, on Urthona’s dens. 19. Where the son of fire in his eastern cloud, while the morning plumes her golden breast. 20. Spurning the clouds written with curses, stamps the stony law to dust, loosing the eternal horses from the dens of night. crying Empire is no more! and now the lion & wolf shall cease. Let the Priests of the Raven of dawn, no longer in deadly black, with hoarse note curse the sons of joy. Nor his accepted brethren, whom. tyrant. he calls free: lay the bound or build the roof. Nor pale religious letchery call that virginity. that wishes but acts not! This entry was posted on Ιανουαρίου 31, 2009 at 11:22 and is filed under European Poetry, Project Romanticism. You can follow any responses to this entry through the RSS 2.0 feed. You can leave a response, or trackback from your own site.